Beware the ties of March! I guess Julius Caesar should have heeded the warning of the blind man (wasn’t he blind?) in the square, before he and his tunic and laurel sashayed into the Senate foyer. Hindsight rarely saves a man, though, especially when the business ends of a few daggers are headed your way. Such an interesting way to execute (literally) a recall vote…now political opponents just go to the media, and babble and tweet and post. Infinitely more legal, obviously. Well, I’d be Brute-ish if I didn’t remind you that it’s March 15, which is but a day before the 1-year anniversary of starting 100 Days, 100 Ties. 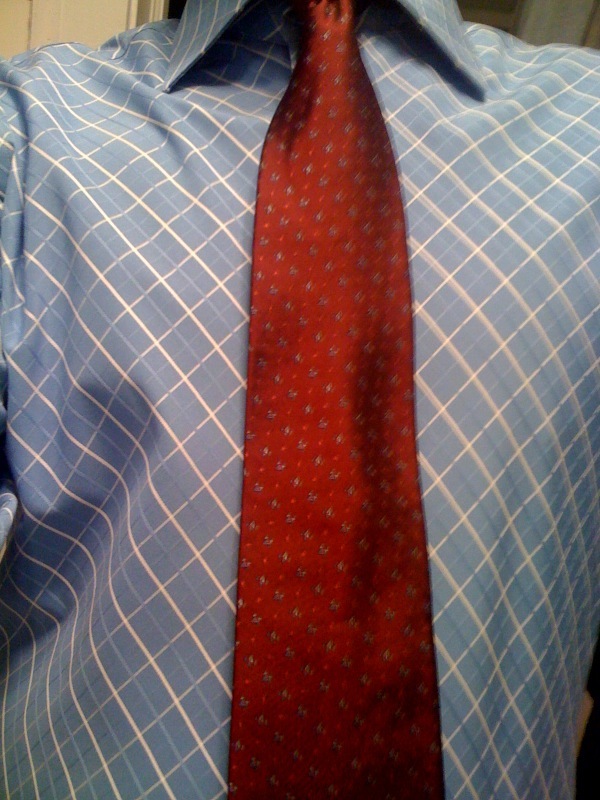 I’m sure I’ll mention it then, but for now let’s take a gander at Tie No. 243. It’s rather staid, compared to the rest of my collection. It’s from the Claiborne line, which I was surprised to learn was entirely a JC Penney mark. Go, JC, go. I tried to pomp (or pimp works, too) it up with my blue shirt, but it didn’t really wake it up. Oh, well. I have mentioned recently (as I have before) that a quick glance at my tie rack makes it painfully obvious that there will be some painfully morose days coming up in the TdJ department. When I’ve had this problem before I’ve simply made a trip to the resale shop(s), but I gave up buying ties for Lent. Boring ties be damned, I may as well try to make a dent in the Unworn Collection, and 40 days won’t kill me. Editor’s note: My Lenten penance only states that I cannot buy any ties; it doesn’t say anything about accepting gifts of ties. And, would you look at that, my birthday is coming up on April 8. I’ll be 42. For a whole year. This entry was posted on March 16, 2011 at 12:34 am and is filed under Uncategorized. You can follow any responses to this entry through the RSS 2.0 feed. You can leave a response, or trackback from your own site. Love your play-on-words, particularly “brutish.” Like the shirt. Did you see that Stephan Colbert gave up Catholicism for Lent? He said he has become Jewish until Easter, which made him feel obligated to tell people to call their mothers.